Scarlet Snake-Needle Grass is an erect, annual herb, 6-45 cm tall. Stem is unbranched, slender, round or rarely obtusely quadrangular, internodes up to 10 cm long. Leaves are opposite, linear or narrowly lanceolate, 1-5 cm long, 1-8 mm broad, pointed, margin curled, upper surface scabridulous, rarely hairless. Stipules are 1-3 mm long, ending in 2-6 threadlike 1.5-3 mm long appendages. Scarlet flowers are borne in laxly branched, of 1-few flowered cyme. 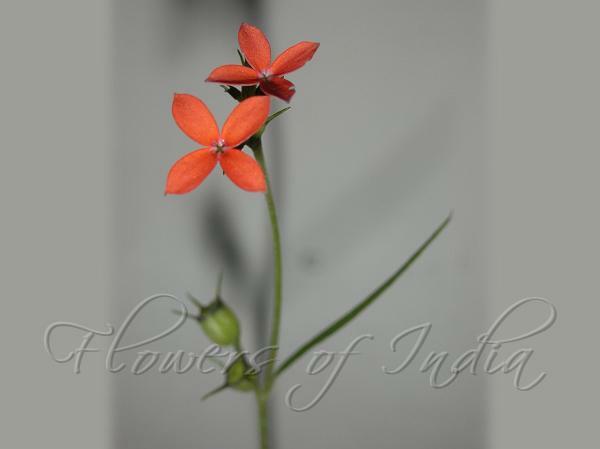 Flowers are borne on stalks 0.5-7 mm long, enlarged in fruit. Sepal-tube is densely papillose, ellipsoid 1-1.5 mm long, sepals narrow, about 2-4.5 mm long, elongated in fruit. Flowers are scarlet, pink or purple, hairless or scabridulous above. Flower-tube is 3-6 mm long, dilated above, dilated portion about 2.5 mm, petals 1.5-3 x 0.8-1.5 mm, oblong-elliptic, blunt. Anthers are 0.8-1.0 mm. Style 1-1.5 mm long; stigma 1 mm long. Capsule is oblong, round or elliptic 3-6 x 2.5-4.0 mm, minutely scabrid, with a slightly raised, dark brown about 0.3 mm long beak. 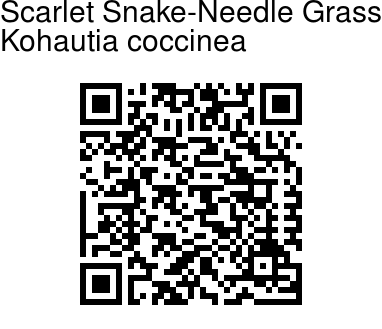 Scarlet Snake-Needle Grass is found in the Himalayas, at altitudes of 1600-2700 m, from Kashmir to Nepal. Flowering: August-October.